How Come I’m Not Landing Any Freelance Jobs? You went through the preliminary steps to get your freelance writing business off on the right foot. Many freelance writers fail within the first year. You set up a writer website and even guest posted to help build your portfolio. You scoured the net for freelance writing jobs and started pitching your little heart out. But, either you never hear from the pitches you sent out ever again, or the ones you do hear about, never ask you for another project. Why aren’t you landing any consistent freelance writing gigs? Believe it or not, many new freelance writers are faced with this scenario. They’ve figured out how to pitch and where to look for freelance writing jobs, but haven’t yet landed a steady gig. And what ends up happening is that they give up. 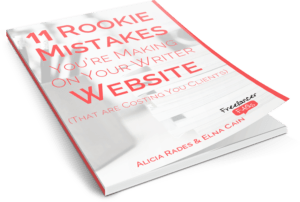 Many freelance writers fail within the first year! That’s tough to hear. How can you be sure you’re NOT one of those freelance writers? Within these instances, there can be missed opportunities that could ultimately help you land a well-paying freelance writing gig. Let’s look at three of them. When you send your pitch, what do you do after? Do you move on? Mark it on your Google sheet? Hope and pray about it? For many freelancers, they note it and forget it. When you’re knee-deep in pitching mode, there’s nothing stopping you from reaching your daily pitch goal. But, this is where the missed opportunity happens. A good practice and rule of thumb for freelance writers is to always follow-up on the pitches they send out. Follow them on social media – do they have a Twitter account or Facebook fan page? Follow and like them. This helps you keep tabs on future prospects but also nudges them and reminds them of you. Comment on their blog – do they have a blog? Why not leave a comment? Again, it’s just another way you can get on their radar. Send a follow-up email – If after a week or two you don’t hear back from a pitch you sent out, send a follow-up email asking them if they filled up the position or not. This is my preferred method and something I teach in my freelance writing course. I totally understand that if you’re a new freelance writer who has never pitched in their lives, let alone negotiate job terms, corresponding with prospects can be daunting and overwhelming. I get that, but you still have to remember you’re the professional here and you are NOT an employee; you are a collaborator. The prospect is inquiring about your services and isn’t looking to hire you, but to collaborate with you on a project. So, when a prospect actually seems interested in your services, you end up squashing the deal before it even started. Ouch! Another missed opportunity down the drain. Maybe you’re like me when I first started freelance writing. I guess I’m a little Type A and need to know EVERYTHING before I begin a project. Naturally, I have a boatload of questions I want to ask. And what did I end up doing? After I received an email from the prospect that they want to know more about my services, I emailed them 15 questions to answer. Uh…would you run for the hills if you got this email from a prospect? I think you would. And this prospect ended up running away too. I learned early on, that this approach was too pushy and overbearing. Now I know better. You know the one thing I noticed freelance writers do frequently? It’s failing to wow their clients. It’s always best practice to show your best work and act professionally always, but especially on the first project. Even though it’s a one-off gig, you never know if that client – had they received sensational and stellar work from you – would have hired you for more work. Exceed deadlines – if it’s possible, try to exceed deadlines, even if it’s by a day only. Reply to emails promptly – I always try to respond to emails within 24 hours. Go above and beyond – Offer to upload your piece to their CMS (WordPress) or ask if they’d like a feature image for the post. These little things pay off big. I often do little things for my clients and I know they appreciate the extra help. As you can see, this client only wanted one article. We worked out the terms and I submitted my post to this client. Landed four posts a month from a one-off piece, just by exceeding the deadline and doing a good job on the post. Here’s only three little things you can do to ensure a better chance at landing and keeping a gig. My course has two entire modules dedicated to your writing work and client work so that you can wow your clients and keep them. Because all you need is a few recurring gigs to be able to say good-by to your day job for good and hello to the world of freelancing! Guilty of not sending a follow-up email. This post has been a great reminder. Thanks for sharing! Thanks so much! And thanks for admitting your fault. Sending a reminder email can really help in getting in the mind of the person hiring you. That extra effort can really pay off in the long run. Follow up has been a problem for me. Recently I created a CRM type of process where all my follow up, comments, and social engagements are scheduled tasks. Now I don’t forget and I don’t over schedule myself. Thanks for the tips Elna. Thanks! Yes, follow up can be a problem for some writers. I know for me I have to schedule it in or else I forget! And I see I’m not the only one! I’m another one that can get a bit lax in following up. I ought to follow your lead, Elna, and literally schedule it onto my calendar! I created an Excel spreadsheet for all my prospects, with three separate tabs – LOIs and Queries, Warm Prospects, and Clients. For LOIs and Queries, I note the name of the contact, their title, their business/organization, contact information, initial contact date, their response (if any), and first and second follow-up dates. The Warm Prospects tab shows me who responded favorably, when they responded, and my first follow-up date from their positive response. I’m finding that even if a prospect responds positively, I sometimes still have to follow-up from that feedback…hey, everybody’s busy and that’s the nature of the business. That’s a great system to keep track of your leads! Good job! Thanks Elna! Actually I’ve more or less followed these advices but I’m still not getting much clients lol. It’s been a month and I have 2 so far. But I’ll keep going. 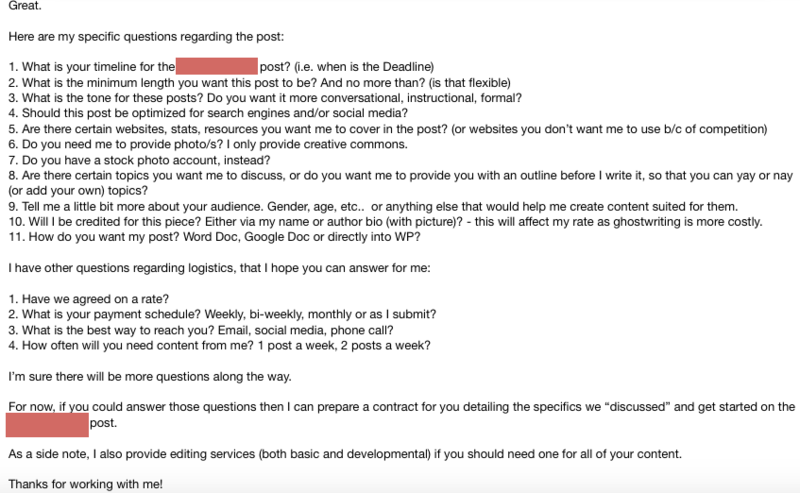 My first client only needed 2 blog posts per month and last month I submitted way before deadline. This month they asked me to write 1 more article. So yeah, going the extra mile works! Well that’s good at least. Clients request more or less pieces depending on their needs and budget at the time. Good luck! It’s hard to hear so many freelance writers fail in a year! I don’t want to be one of them but I am struggling to land that first client. I’ll be putting these tips to good use I hope and keep trying. I’ve totally made notes from this. So far I’ve only worked on freelance graphics jobs, which are much easier because I’ve been told exactly what someone needs, but I’m definitely going to keep things simple when I get to negotiate what copy clients need! And I am very guilty of not following up with people. I never follow-up. I just assume and give up. Thanks Elna. It was the most important reminder at the crucial time when I was about to leave freelance writing. You know the reasons I guess. Thanks for sharing. I know there have been times where I overloaded a potential client and then never heard back or got a similar email to the one that you got. Another awesome post full of really valuable information. I’m just starting out in the business and have referred to your site for help a number of times – and I’ve never been disappointed!